The first born child of John Yeo and Elizabeth Brace Yeo was named Henry (Harry), who was born in 1853, most likely at the Bustleys' Bridge home. He worked in Wales in the mines for some years before emigrating to the United States either with Grandpa and Thomas or later. He married Emma Lewis who was born in Radford, Somerset on February 22,1860. At the time their names appear on a census in Wales, an infant daughter, Catherine was listed, and Isaac, a brother of Emma was also living with them. It is not known whether either of the children accompanied them to the states. Harry and Emma lived in Montana .In 1890 Harry was a miner in the silver mines and they were living in Walkerville, Silver Bow, Montana. Harry died in 1917 and Emma died December 10, 1952. Harry was a miner in the silver mines and in 1910 he was still in Walkerville and living with him was his niece, Elizabeth, daughter of John & Emma. Harry died in 1917 and Emma then applied for a passport in 1922 to visit England. On the application she states that Henry arrived in America in May 1880 having sailed from Liverpool and that initially he lived in Michigan and that he was naturalised as a citizen of the United States on October 15th, 1892. She died December 10, 1952. Emma and Harry are buried in Mount Moriah Cemetery in Butte, Montana. Grandpa John married Emma Selwood and then emigrated to America. George Yeo, son of Elizabeth Brace Yeo and John Yeo was baptised at Harracott, Tawstock Parish, North Devon on April 28, 1857. As a lad he worked at various farms in the neighboring parishes and subsequently moved to Wales where he worked in the mines. According to Sheila Yeo of Kingsteignton, Devon who has been of immeasurable help to me in this search, George lived for a time in the London area where he worked for the water board. It may be here that he met his wife Rose Emily Remnant (nee Marshment) .. Two of their children were born in the London area. Rose had been married previously to a Jesse Remnant. Eventually George returned to Wales and spent the rest of his life there, working in the mines. The family lived for many years in Llanbradach, near Caerphilly, Wales. I was very pleased to have met two of George and Rose's grandchildren when I visited Cardiff in April 2002. Rose, the daughter of George William Yeo and Ella Rosina Morgan subsequently married Aneurin Silcox; and Kenneth John Yeo, only child of Thomas Yeo, the youngest son of George and Rose. At that time I also met Kenneth John's son Jason. Apparently the family lived at the same address in Llanbradach as I have a letter which Rose wrote to Grandpa, not dated but my friend Sheila determined it was written in 1923, in which she told of their life in Wales. 18 Wingfield Crescent, Llanbradach, Wales taken in 2002. George and Rose lived here with their family. The family gave me some pictures which I have included. Some of the pictures they gave were not suitable for copying. I was very pleased also to be able to visit the home at 18 Wingfield Crescent, Llanbradach; it appears in very good shape and is still occupied. Rose and her husband Aneurin also took me to Holy Trinity Church at Ystrad Mynach, near Llanbradach where both George and Rose are buried. The children of George and Rose are listed below. In some cases I was not able to get information on some of the children. If and when information becomes available I will send it on. Holy Trinity Church, Ystrad Mynach, nr Llanbradach where George and Rose Yeo are buried. Catherine Elizabeth Yeo, born 1899. Rose Yeo, born 02 Dec 1900. Emily Yeo, born 15 Jul 1903 in Staines Area, London. Lily Purbrick. She married Douglas Talbot. On the left is a photograph of Thomas Yeo (b. 1911) and his wife Nan. Jayne A Smith. She married Alan John Bickley. Mary Anne Yeo daughter of John Yeo and Elizabeth Brace Yeo was born at Bustleys' Bridge, September 2, 1859. She worked as a glover before marriage. There is not a great deal of information on her first marriage to a John Pearce. They may have lived in Wales where he worked in the mines and was killed on the job. Mary Anne returned to Yarnscombe Village with five children, to live with her parents. I have some information on the other children of the marriage of John Pearce and Mary Anne Yeo Pearce. The eldest child was Thomas, a farmer who lived at Roodge Farm, near Yarnscombe. He had one son, John, two daughters, Elizabeth and Florrie, who married William Hill. The second child was Martha Elizabeth (known as Lizzie) she was born 1885 and died August 1977. She married Frank Pickard who was born in 1892 and died in 1961. They had one daughter, Mary who married Ivor Badcock in Newton Tracey Church. Frank Pickard and Martha Elizabeth Pearce Pickard are buried in the Methodist Churchyard in Yarnscombe. George who lived in South Wales. I believe he had one son, Sidney who died in 1979. George's son had a son who died in 1979 called Fred. 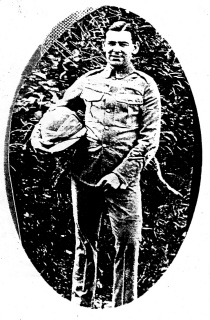 He worked for the railroad, and took the middle name of Yeo, and was referred to as Fred Yeo Pearce. He died in 1953. 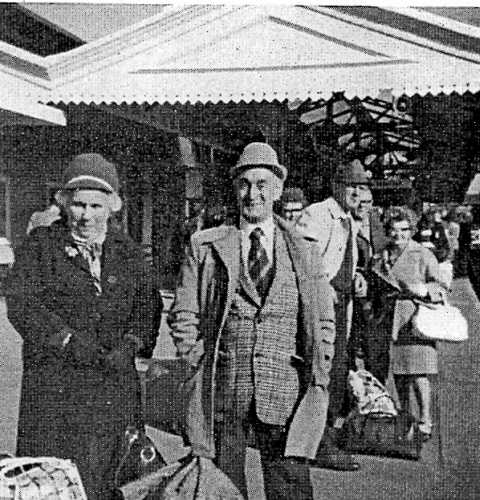 His first wife was named Lily, she preceded him in death, second wife Flo died and his widow, Betty nee Norgrove survives him and at present she is living in Staffordshire. There were no children of these unions. She subsequently married a William Ellis. There were two daughters born to this couple, Olive and Rosa. 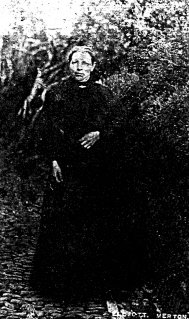 Mary Anne died in Yarnscombe Village on July 13, 1925. She is buried in St. Andrew's Churchyard, Yarnscombe Village, as is her husband, William Ellis who died June 12, 1940. I do not have a date for the second marriage of Mary Anne Yeo Pearce to William Ellis. We do know he was a cobbler who lived in Yarnscombe. However in 1901 they were living in Yarscombe and Frederick aged 11 and William aged 9 were recorded with the surname Ellis as well as their own daughter, Rosa. Mary Anne Ellis died July 13, 1925 and is buried in St Andrew's Parish Churchyard, as is her second husband, William Ellis, who was 73 years old whe he died June 12, 1940. Gilbert and Ronald Ford were brothers who married sisters, Rosa and Olive Ellis. Both Bert and Ronald were farmers in the Yarnscombe area. Olive and Bert had two sons, Owen and Harold and Ronald and Rosa had a daughter who died as an infant and another daughter, Gwenyth who married Arthur Pengelly of the Beaford area. Bert Ford who was born in 1903, died in 1986 and is buried in the Methodist Churchyard, Yarnscombe as is his wife, Olive who died March 19, 1992, at age 89. 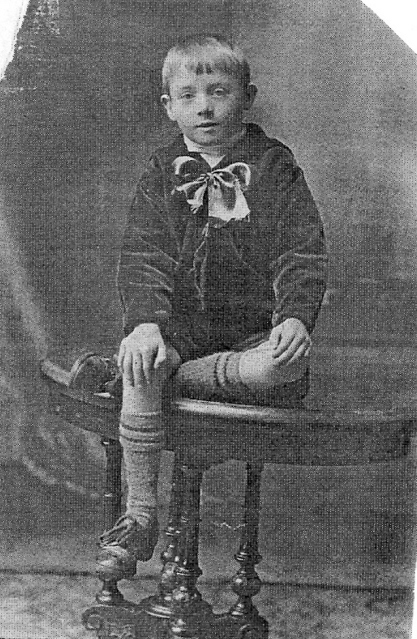 Thomas who either emigrated with Grandpa and Harry or later, was not married at the time he came to this country. He lived for a time with Grandpa and his family in Northern Michigan and worked in the mines, as did Grandpa. He apparently fell out grandpa's good graces and left, and was never heard of. I have made several attempts to locate his descendants, if any, but have had no luck. Elizabeth, daughter of John Yeo and Elizabeth Brace Yeo was born in 1865 at the Bustley's Bridge home. Not a great deal is known of her youth but she was probably employed in the area until her marriage on the 30th of March, 1889 to a William Henry Oliver, who was employed as a plate layer. He lived in Holsworthy, North Devon. At the time of marriage, both Elizabeth's father, John Yeo and William Henry's father, John Oliver, were deceased. 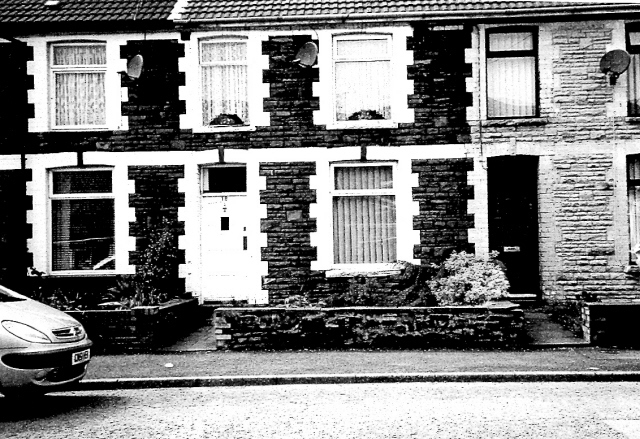 In 1891 William, Elizabeth and baby John were living at 31, Vaughan Street, Gelliwion in Llantrisant, Glamorgan, S. Wales and William was a coalminer. By 1901 they had moved to 15, Lee Street in Rhondda, Lantrisant and William was a hewer of coal. underground. Living with them were children, John, Ernest, Albert, Julia, Beatrice and Edith who wa just six months old. According to the electoral records of Pontypridd (Wales) the Olivers were living at 7 Pwllgwaun Road. In 1924 they were still living at this address with one son, Francis Edgar Oliver In 1927 they lived at the same address and two other sons were living with them, Harold James Oliver and William Oswald Oliver. Elizabeth and William had nine children. The accompanying picture shows that there were three girls. I had some information from a distant family member who told me that two of the older boys who were stretcher-bearers during World War I were killed. I am not sure of the names of those young men. I do know the names of the other boys and of the three young girls in the picture but do not know which name goes with which person. At the time of Elizabeth's death, one of the sons, James gave the information on the death certificate. 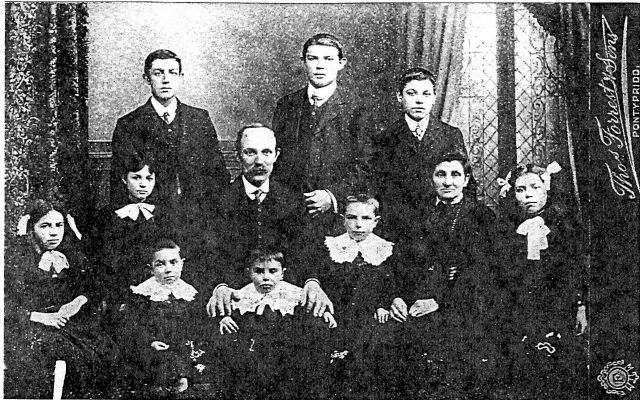 Also from a letter written during World War 2 by one of the daughters, she mentioned that two of the remaining sons (apparently those in the middle row of the picture) would soon be called to duty but that a third son would not be, as he was a miner and would be exempt. The three girls, Beatie, Edie and Blanche (called Polly) apparently never married. Edie lived and worked in London during the second World War. I believe she kept in close touch with her other two sisters, Polly and Beatie but I don't know where they were. Unfortunately, anyone who might have this information is no longer living. I have searched the Commonwealth Graves Commission web site in hopes of finding the names (and places of death) for the two sons allegedly killed during World War I but have not had any success with this search. Amendment - 2008 - Both boys enlisted in the 16th Bn Welsh Regiment on the same day on the 4th December, 1915, Albert's service number was 24115 and Ernest's 24116. They were to serve in France as part of the Battle of the Somme. Sadly Private Albert Thomas Oliver died on the 7th July, 1916 and is buried in FLATIRON COPSE CEMETERY, MAMETZ and his brother Private Ernest G Oliver died just three days later and is buried in DANTZIG ALLEY BRITISH CEMETERY, MAMETZ. The village of Mametz in France, was carried by the 7th Division on 1 July 1916, the first day of the Battle of the Somme, after very hard fighting at Dantzig Alley (a German trench) and other points. After the capture of Mametz on 1 July, the 7th Division pushed gradually forward over the next few days, being relieved on 5 July by the Welsh New Army Division, the 38th.